While mortgage delinquency rates are at a record low of 1.24% of all mortgages, Servicers continue to face a number of challenges that keep costs high, placing downward pressure on profits. Although they make up only 2% or so of all loans serviced, Servicers typically have to allocate as much as a third of their resources to process Non Performing Loans (NPLs). This makes NPLS roughly 13 times as expensive to process as Performing Loans (PLs). Until Servicers find ways to control costs of NPLs, their businesses will likely continue to generate low profit margins. The Mortgage Bankers Association (MBA) estimates that the non-reimbursable costs and direct expenses associated with FHA’s foreclosure and conveyance policies were two to five times higher than for Government Sponsored Enterprise (GSE) loans. According to the FHA’s Single Family Loan Performance Trend Report, it takes an average of 12 months to convey a foreclosed property to the FHA. Furthermore, nearly 43% of the 2015 and 2016 FHA insurance claims filed received an interest curtailment penalty because of missed first legal action deadline (29%) or reasonable diligence deadline (14%). Current Approaches Don't Make Sense. The Servicer’s business is optimized to process large volumes of performing loans. It is not optimized for managing the many and varied processes necessary to bring a foreclosed property to conveyance. This becomes especially difficult and expensive with FHA foreclosed loans. MBA’s analyses show that nearly a third of a Servicer’s resources are allocated to processing less than 3% of its overall loans. Or put another way, NPLs are 13 times as expensive to process than performing loans. Clearly, the current approach is very inefficient and costly. A better alternative is to simply refer a foreclosed property to a single vendor who can perform multiple claims and conveyance-related processes at the same time, thereby significantly cutting the cost and time to conveyance. This paper discusses this new, innovative approach in detail by first outlining the key trends that affect Servicers and how these can drive the costs of NPLs, especially FHA foreclosed loans. 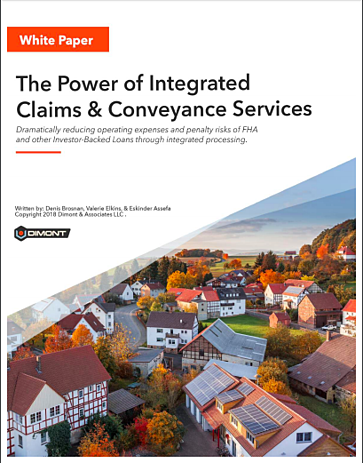 The paper then discusses how integrated processing of claims and conveyance-related servicing activities will dramatically cut operating expenses and mitigate penalty risks on FHA loans and other investor backed loans. Finally, this paper shows how DIMONT’s Collateral Loss Mitigation Service, an end-to-end conveyance management platform, can significantly cut the time to conveyance, thereby reducing the total cost of conveyance on average by as much as $800 per foreclosed loan.